This memorial website was created in memory of our loved one, Bob Spalding, 61, born on November 13, 1911 and passed away on November 10, 1973. Where Bob Spalding is buried? Locate the grave of Bob Spalding. How to find family and friends of Bob Spalding? What can I do for Bob Spalding? Dr Michael Werlinich was a surgeon in CA during the 1960s and 1970s. He developed a new way to perform spinal surgery by going through the abdomen and not around the spine. He operated on my ex-wife and the result sere phenomenal. In talking to him after the surgery he told me that while he was in NY that the hospital said that they were making too many back cripples from the old method and to come up with something new. He developed a procedure to open the lower abdomen, pack all of the organs off to the side and he said there was room enough for two pairs of hands to work on the spinal area. The old method took days of hospitalization and recovery and while his procedure was painful at times my ex-wife was driving and back to work in 6 weeks. My mother had the old method and in six weeks was still in a back brace and home bound. I will always remember this man for his kindness and his being there at our moment of need in repairing my wife's back. It has been over 40 years since the surgery and from what I know and have seen she is doing well with no back pain that I am aware of. Thank you Dr. Werlinich I will never forget you. Note: Do you have a family photo of Bob Spalding? Consider uploading your photo of Bob Spalding so that your pictures are included in Bob Spalding's genealogy, family trees & family history records. Sysoon enables anyone to create a free online tribute for a much loved relative or friend who has passed away. Address and location of Bob Spalding which have been published. Click on the address to view a map. Bob Spalding was born in New York, United States. 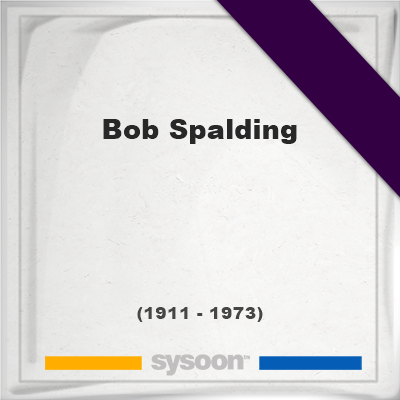 Bob Spalding died in Duarte, CA, United States. Bob Spalding is buried in Covina, CA, United States.